Reunion a Wyndham Grand Golf & Spa Resort in Orlando, Florida Near DISNEY! Reunion a Wyndham Grand Golf & Spa Resort in Orlando, Florida Near DISNEY - Buy a 7 Night Stay in a 3 Bedroom Suite for up to 8 Guests! 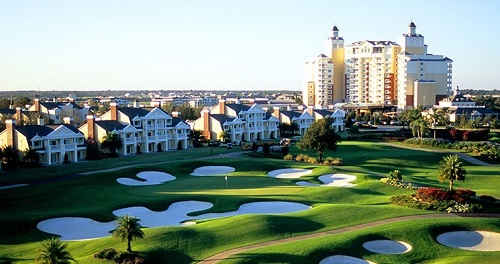 Enjoy 7 Nights in a 3 Bedroom Suite at the REUNION a Wyndham Grand Golf & Spa Resort in Orlando, Florida Near DISNEY! Centrally located between its sister Grand Golf Resorts of Florida properties, and only a short 30 minutes from the Orlando International Airport and six miles from Walt Disney World, Reunion Resort's exclusive 2,300-acre community has the space, amenities and accommodations to bring together families, golfing buddies, social events and meetings. Our boutique spa offers the pinnacle in serenity and ultimate luxury with massage therapy, skin and body treatments and nail services, all with the warmth of home. Whether in one of our carefully appointed treatment rooms, outdoors on our second story veranda or in the privacy of your suite, it’s the ultimate escape. And with the personal attention of our Spa Concierge, no request goes unheeded. Reunion Resort is the only destination in the world to boast three Signature golf courses designed by legends Palmer, Nicklaus and Watson. Combining the beauty of their natural landscaping with unique and challenging layouts, these courses have won numerous awards and followers over the years. 3 Bedroom Suite: Sleeps up to 8, and comes with full kitchen. Resort charges a REFUNDABLE security deposit of $710 USD. On-site construction or remodeling may disturb guests from January 11, 2019 to June 30, 2020.